Now, before you become distraught and start with the wailing and gnashing of teeth, note I said “standard install model”. There is a way to get it working. 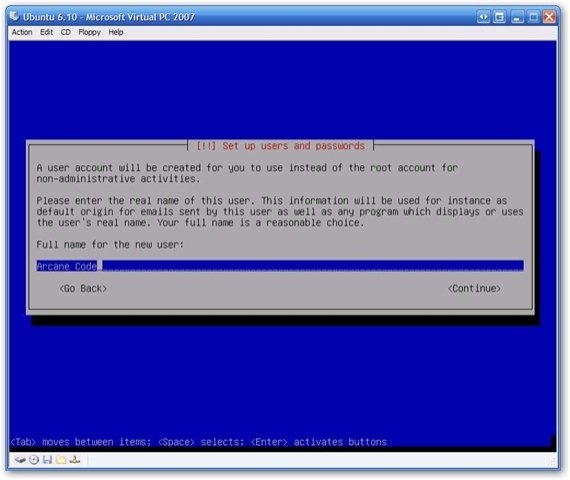 Before you get started, spend a few minutes getting familiar with VirtualPC if you have not already done so. You can find my step by step instructions for VirtualPC at https://arcanecode.wordpress.com/2006/09/20/virtual-pc-step-by-step/. Keep it handy, at various points I will be referring to it. OK, let’s get started. First, you need the right installer. 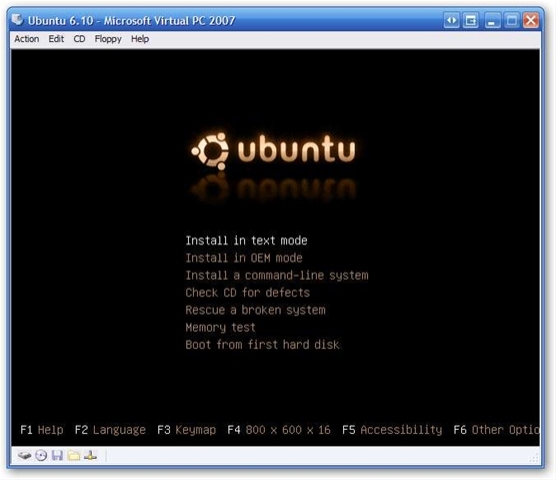 Go to the Ubuntu website (http://www.ubuntu.com). Under desktop, click the Download link. Scroll down to the Ubuntu 6.10 area. Click on the region you live in, and find a mirror close to your location. Now, here is the inside trick, instead of “CD Image for desktop and laptop PC’s”, you should instead select “Other installation options”. When the next screen comes up, scroll down to the “Alternate install CD” area. Find the link that says “PC (Intel x86) alternate install CD” and download the ISO it’s associated with. It’s a big download, so be patient. Note that selecting the right version is the first thing you have to know, but there’s a few other tweaks you’ll have to do during the install process, so keep reading. Once you have it downloaded, burn it to a CD or use Virtual CDRom Control Panel (see my post https://arcanecode.wordpress.com/2006/09/13/virtualization/) to load it into a drive. In Step 1 of my VirtualPC Step by Step you are instructed to create a new machine, please do so. I’ve named mine “Ubuntu 6.10”. In step 2, you are prompted for your OS. You will need to pick Other. In step 3, you are asked about Ram. Ubuntu will run OK under 256 megs, however if you have the available space I’d highly suggest upping it to 512, especially if you intend to get into doing some graphics or mono coding. I’ve selected 512 meg for this tutorial.In step 4 you will want to create a new hard disk, and in step 5 confirm what you’ve selected. OK, now you are up to step 6, installing the OS, which is where this tutorial picks up.Your first screen comes up, but before you start pressing buttons there’s one tweak you have to make. So you can see everything correctly during the install, press the F4 (VGA) button. Select a video mode that ends with 16, in my example you can see I changed to 800 x 600 x 16. Now you can proceed, press enter to start the “Install in text mode” option. The first screen to come up asks about your language. I took the default of English, but if you are elsewhere please select your language, then press Enter to continue. Next you are asked for your location. Select your location, or the one closest to you, and press Enter. Next you are asked to let the installer determine your keyboard. Take the default, Yes, which will take you to the next screen. On some screens there may be keys you don’t have, if so just wait for the time out. After going through each screen, you will see what keyboard pattern Ubuntu detected for you. If it’s correct just click Enter to continue, if not you can go back and reselect. Next Ubuntu will scan for your CD rom, then begin loading components. Just kick back and wait, it will go through all sorts of detection steps as it finds hardware, networking, and more. If all went well, you will now be asked for a host name. I took the default of Ubuntu, but you are free to change it. Enter your host name, or just hit Enter to continue. Next Ubuntu will begin detecting your disks and hardware. Be patient. You will then be asked about partitioning disks. This should be a new partition, so take the default by pressing Enter to continue. The next screen is the first place you don’t want to take the default. It’s asking you to confirm the partition format plan. Use your left arrow to move the red bar (shown below on No) over to the Yes side, then you can press enter. Wait while Ubuntu formats your drives. Next you are asked for your time zone. Select it, then press Enter. Next you are asked if the system clock is set to UTC. I just took the default of Yes, this is easy enough to fix if it’s wrong. Next you are asked for your name. Note this is not your login user name, but your real name. Ubuntu will use this in your documents and e-mails. I entered a name, and pressed enter to continue. On the next screen you are prompted for the user name you want. This is what you will enter when you login. Enter something that suits you, then press enter to continue. If you’ve done this sort of thing before, you’d probably guess Ubuntu wants your password next, and you’d be right. Enter a password and press enter to continue. 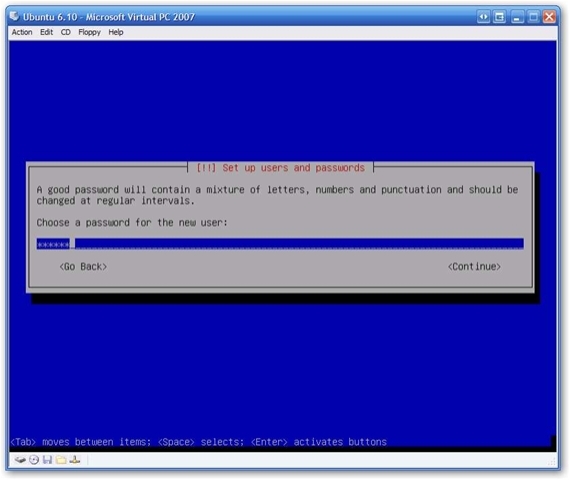 Now you are asked to re-enter the password, to confirm. Do so and press enter to go on. Now sit back and wait. Ubuntu will start installing itself. After running for a while, you are next asked about video modes. Use the space bar to toggle the modes you want, and use the arrows to move up and down. When you’ve selected the modes you want, press enter to continue. Below you can see I’ve selected a few common modes for my system. OK, sit back and wait some more, while Ubuntu installs various software packages. This step takes a loooooooooong time. Ubuntu has completed it’s install. But don’t hit enter quite yet! First, on the Virtual PC menu pick CD, Release Physical Drive Z: (where z is the drive you are installing Ubuntu from). This will let Ubuntu to boot from your newly installed virtual hard drive instead of the CD. After you’ve released the drive, you can hit Enter to continue. When the system reboots, you will see your login screen, but it’s going to look very trashy. Don’t worry, we’ll fix in a moment. Key in your user name, and press Enter. You probably won’t be able to read what you are typing so be careful. If all went well, you’ll now see another garbled screen where you enter your password. Carefully, do so and press enter. More garbled screens will appear. When it appears as if Ubuntu has loaded (see below, if you look close you can make out the menu across the top), press the CTRL+ALT+F1 key combo. This key combo exists the graphic interface and puts Ubuntu in text mode. Key in your user ID, then (when prompted) password to login. You’ll now see a command line, below. We need to modify your xorg.conf file to change the color depth. First, let’s back it up. Type in this command:sudo cp /etc/X11/xorg.conf /etc/X11/xorg.conf.backupNote to copy it exactly, Linux is case sensitive, so if you were to type in say x11 instead of X11 your command will fail. Also, because you are attempting to run the command as the root user (the sudo part of the command) you will be prompted for your password. And hit delete twice, then type in 16. Now hit CTRL+O (WriteOut) to save the file, and press enter to take the default xorg.conf file name. Then hit CTRL+X to exit. Give it several minutes to shut down and restart. If everything worked, you should now see a beautiful, non garbled Ubuntu screen. 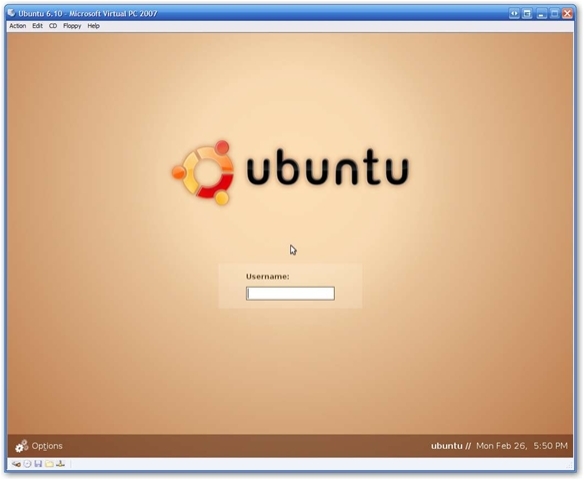 Key in your user name and password and you will be logged in to your working copy of Ubuntu 6.10 on Virtual PC 2007! Thanks! It works excellently I thougt I was going to have to give up on it. Thank you so much for posting your solution and linking to it from the ubunto support forums. Thanks, this is working for me as well with Feisty Herd 4! I’d suggest you add this to the ubuntu wiki and/or forums. Or, with your permission, can I recreate your instructions on there? It would help lots of people! this guide was very helpful! the only problem i encountered was getting to the console. hitting ctrl-alt-f1 after logging in still didn’t work. instead i got into the ubuntu recovery console by hitting the escape key during the boot process. after editing the xorg.conf file and rebooting everything worked great. My mouse isn’t being grabbed by Virtual PC 2007!! I had a similar problem running the live cd, but I hoped an install would fix this! I had the same issue with Fiesty Fawn Build 4, Linuturk. I couldn’t get it to take either keyboard input or the mouse. Still looking for a way, so far I haven’t seen an “alternate install” version of Fiesty. O crumb, I’m sorry. I’m using 6.10 Edgy alternate. The same as your system. I tried to use feisty, but the destkop iso deterred me. Did you experience the same issue in Edgy? I have keyboard control, but not mouse. Could the fact that I’m using a USB mouse affect it? My mouse worked OK with Edgy, and it’s a USB mouse so I don’t think the USB alone has anything to do with it. 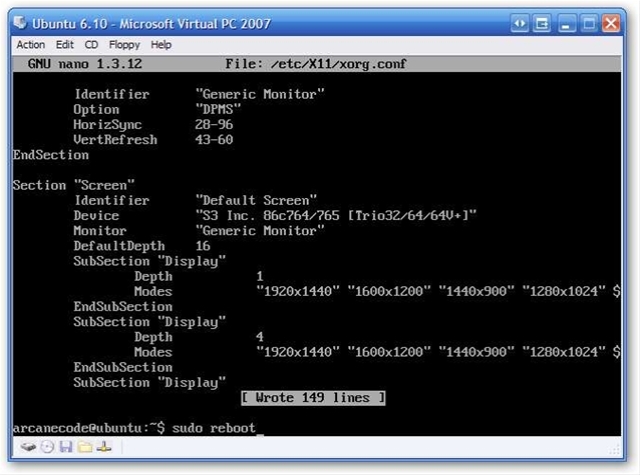 The virtual pc doesn’t recognize USB, it creates a “fake” mouse and translates calls from the real computer’s mouse into the guest OS. It could be though that there’s something about your particular mouse VPC doesn’t like. I use a Logitech MediaPlay mouse on one system, and a Microsoft Mouse on another both USB, and have had no probs with either 6.06 or 6.10. Try hooking up a different mouse, or put the VPC on a different computer and see what happens. Changing the mouse driver on your host OS might help too. Finally, check your xorg.conf file inside Ubuntu. Scroll down to the Input Device section (there are a couple of them). Look to see if you have one with the Identifier of Configured Mouse. Mine says the Protocol is ExplorerPS/2. If you don’t have this, that could be your issue. Let me know and I’ll post the entire section from my xorg.conf. I’m using a standard Dell USB Optical mouse. I’ve checked xorg.conf, and it appears to be configured correctly. I’ve plugged my mouse straight into the computer (it was through the hub on my monitor at first, and I am still not getting access. That process refreshed the driver as well. I tried a standard Microsoft Mouse as well, and it didn’t work either. Here is my xorg mouse section for reference. Install was a breeze. No problems, no special work arounds like Virtual PC. Worked for me, thanks. Ctrl-Alt-F1 didn’t work for me either, so I hit ESC at boot instead. Anyone know how to get a Dell wireless card working inside Ubuntu Virtual PC 2007? As the guest OS, your Ubuntu won’t know anything about your host OS’s Dell Wireless Network Card. 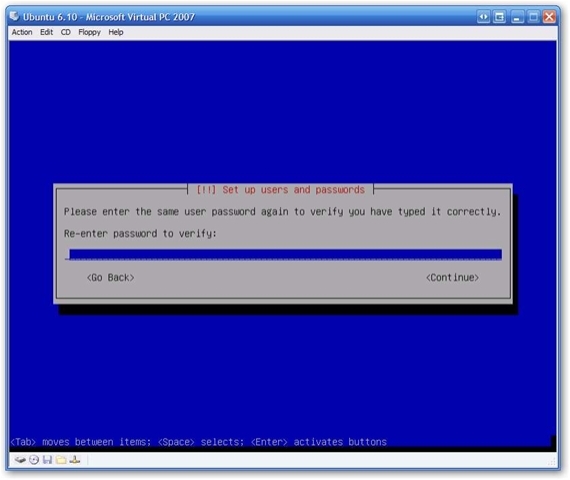 Instead, Virtual PC exposes a standard, no frills card for the guest OS to recognize. What you have to do is connect the virtual network card to one of your real network cards. In the Virtual PC Control Panel, highlight the guest OS (in your case Ubuntu) and click the Settings button. 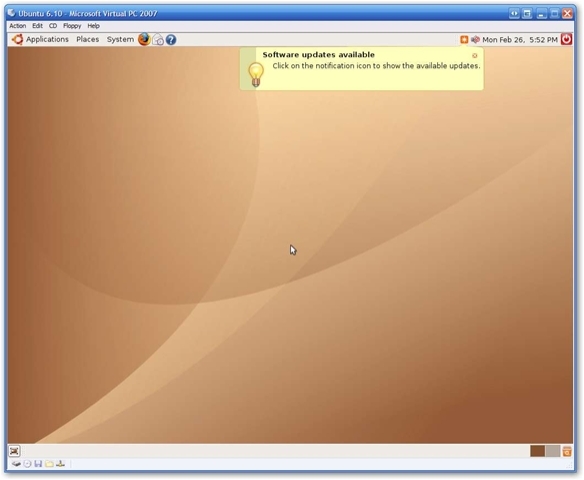 In the dialog that appears, click on the Networking setting on the left side. On the right the dialog will update to show you network adapters. In the drop down for Adapter 1, change it from your current network card to the Dell Wireless card, then click OK. That should fix it, although if you have Ubuntu running at the time you change the setting you may have to restart it. I find myself needing to do this with my VPCs when I switch from my wired connection to my wireless card on my laptop. For more info on the Settings, see my post Using and Tweaking Virtual PC at http://shrinkster.com/mk5 . Thanks for your step-by-step guide! It worked perfectly! Only Ctrl-Alt-F1 didn’t work for me, so I hit ESC at boot instead. Hi tried the dell wireless bit and I cant get a connection? Also the link is no good? Any one else get this bit to work? I fixed the link, the browser was trying to included the period after my link as part of the link. Works now. As to the dell wireless, again read my reply to Scott. If the wireless card is working in the host OS (presumably Windows) then all you should have to do is connect the dots, i.e. go into the network settings and set Adapter 1 to be the dell wireless card. When I hit Esc at the boot it doesn’t give me an option to login to Ubuntu and it goes to the garbled screens so I can’t finish the setup. Doesn’t work for me either. When using the recovery mode after Esc in grub the boot crashes, the os panics and is hung. When entering username & password on the hard to read garbled screens, that works but when disk activity dies and the top menus are visible the Ctrl-Alt-F1 just brings me to another garbled screen which is more unusable than when entering username. Guess I’ll just use the free VMware player and the already installed Ubuntu configured with the tools! sweet. thanks. Ctrl Alt F1 didnt work for me either. but i used the recovery console. thanks. Great guide but I think an easier option would be to use vmware server. I’ve installed Kubuntu 6.10 in 15 minutes with not so much as thinking about editing a conf file. 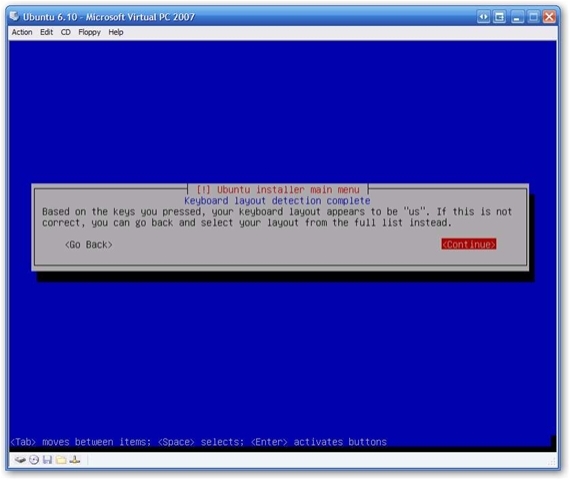 If you don’t wont the vmware server eating up resources just install the server then after you get the virtual machine built unistall and then install vmware player a much lighter version that only plays virtual machines. anyone got a generic Ubuntu 6.10 vhd that they’re willing to share to save others the pain? 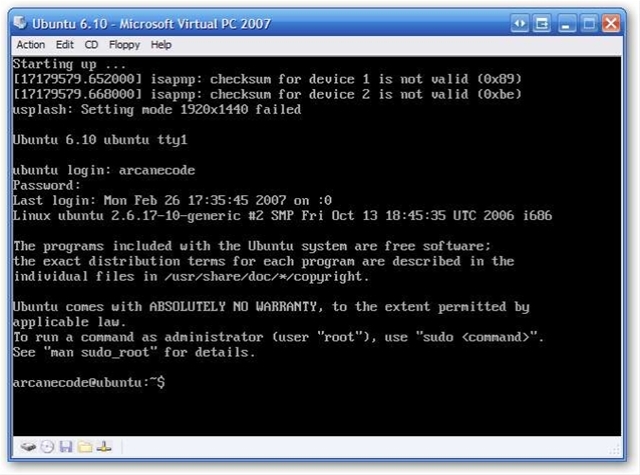 I want to try Ubuntu on VPC2007 but this process kinda scared me! If 6.10 gives you issues, you might try 6.06 as it was a little easier to install. Also check out openSUSE, I have posts on how to install both of these on this blog. The graphical installer then shows up nicely / not garbled. I do wonder though if this is specific to my system (powerbook G4), since I tried “800×600 16” (the rest exactly the same), and the screen still messed up. Anyway, hope it helps someone else out there. Tried doing that exact thing with the Windows based version of VPC, but no luck, the graphics still came out garbled. I suspect it’s something to do with you running a Mac version. Nice to note for the Mac users out there. OK, it seems to be a fluke… I tried my own instructions again, and it didn’t work – the screen was garbled. Is there a Virtual Machine Additions for Ubuntu? I did the esc also at the Grub loader. That seams a little easier than what was set forth in the walkthrough. But I have to say that I wouldn’t have been able to get Kubuntu 6.10 up and running without this information. I am an newbie to Linux (tryied older versions of Mandrake and some RedHat but it was sooooo quirky). I love Kubuntu and I think I can finally promote Linux on the users desktop as a replacement for Windows. I’m also usining it on a Virtual PC. It runs jsut fine with AMD 64 3200+ with 256MB deticated to the VPC. seeNow hit CTRL+O (WriteOut) to save the file, and press enter to take the default xorg.conf file name. Then hit CTRL+X to exit. I am a moron and there are others like me who typed ‘insudo’ thinking it was a command. Brilliant instructions worked pefect once I typed in the right thing! Good catch Mark. WordPress kept hosing up my html. I tinkered with it some tonight, and have it looking halfway decent, and fixed the type you found. Thanks. Great post! Your step-by-step helped greatly. Also thanks to those pointed out editing the /etc/X11/xorg.conf via the Esc key and a restore boot instead of the Ctrl+Alt+F1 key combo. Worked Great! Though the text mode install screens were half cut-off, I was able to futz through it. Thanks for the instructions! I can’t get it to switch to text mode after reboot. I have tried as many ways as I can think of. Is there anyway to boot it directly inot text mode? thanks for the wonderful guide.. although it didn’t work when i tried going in to the txt mode, so i read through the comments and found out that using ESC rebooting in recovery mode works. Haha the screen loaded and i was just waiting for what to do next..
now to figure out why i did all this and how to use linux.. and for what. hi this is suhas i got this site through one of my friend and i downloaded the kubuntu and burnt it on a cd and nw its nt booting from my cd…………. :( ….m using windows xp and very despirately want to install kubuntu……..could any plz tell me how do i install it?????????????????????????????????????? (K)ubuntu 6.10, Virtual PC 2007 on Windows XP SP2 with Dell M70 hardware works like a charm. Thanks for the clear instructions. I almost gave up. 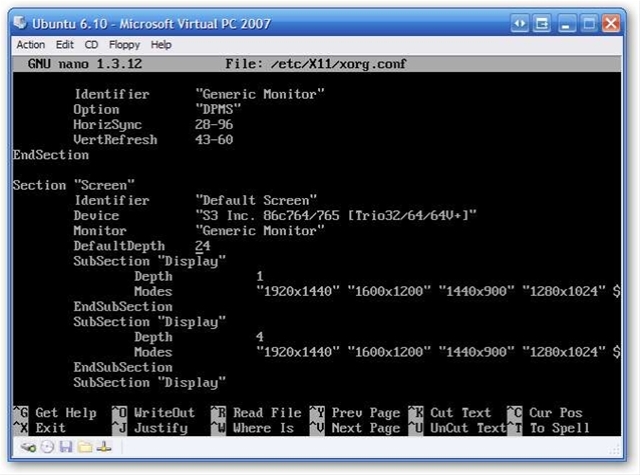 You can load the ISO file into Virtual PC 2007. You do not need to burn it. Does the install software step take internet? because my internet is really slow. If it does take internet how large is it tring to download? Now install Ubuntu and the screen will be garbled. Sorry for such a newbie question. When installing Ubuntu os under Virutal PC 2007, does Ubuntu really partition your physical hard drive or is this partitioning a virtual hard drive? 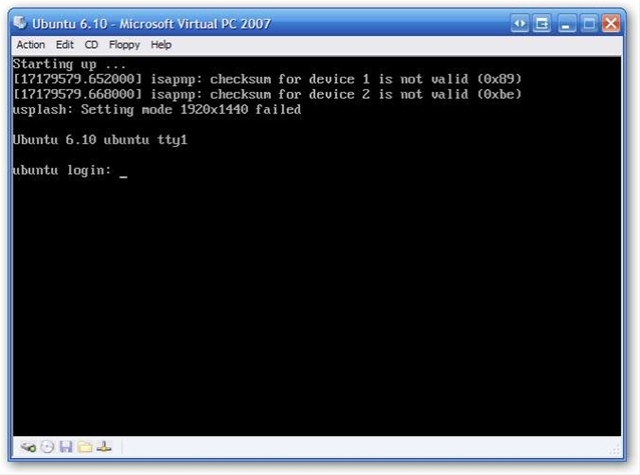 I’m currently trying to confiugure an Ubuntu Server 6.06 LTS (so without X) on VirtualPC 2007. The install process went fine, it took me about 5 minutes to figure out how to fix that weird screen resolution problem. “That’s Kool”, i said to myself… I was really afraid it wouldn’t work, as my company had decided to use one and only one virtualization software (that’s it – i just *can’t* install VMWare or Qemu or anything else). This VM is to be used in a *kind of* production environment, there’s in fact an apache installed that serves one of our php intranet site (this app won’t run on Win32/IIS or even Win32/Apache). But as we have no dedicated hardware available for a LAMP server, we just can’t do without virtualization. Moreover, this VM must join our Active Directory domain. That’s fairly simple to carry out using Samba/Winbind blah blah blah. Already done it using VMWare anyway, worked like a charm. Actually, I had to configure Kerb 5 to authenticate users against AD. People who are familiar with Kerberos surely know that time synchronization between clients and servers is necessary for Kerb to work properly. command to synchronise my ubuntu machine with the NTP server on the domain controller. Job’s done. next part after lunch. Indeed, when i tried to get a Kerb ticket from DC using the kinit command, i got an error message telling me “time skew too great”. uh ho. Suhas, once Kubuntu is up there should be a desktop icon that will let you install. But be warned if you do it will wipe out your windows installation! Better to follow the instructions in this or my 6.06 install instructions into a Virtual Machine first, to see if you like it. Andrew, not sure what the issue could be, about the only thing I can think of could be disk space in the host, you might also try increasing the ram you’re giving to the guest OS (Ubuntu) if you have enough ram on the box. Mystical, if you downloaded the ISO, then no it really shouldn’t be going onto the net. Click on Edit, Settings on the virtual pc, scroll down to network, and verify that your network adapter is hooked to your physical network card. ACHSS, I’m curious which version of Ubuntu did you use, I could do your steps in 6.06 but not 6.1. Greg, no Ubuntu does not touch your real physical hard disk, instead it “partitions” your virtual hard disk, or the VHD file Virtual PC creates for you. So you can safely let it format, partition and install in the virutal machine without risk to your real hard disk. Erwan, that’s quite an issue you have there, I haven’t tried the Ubuntu server edition so I’m afraid I can’t be much help. 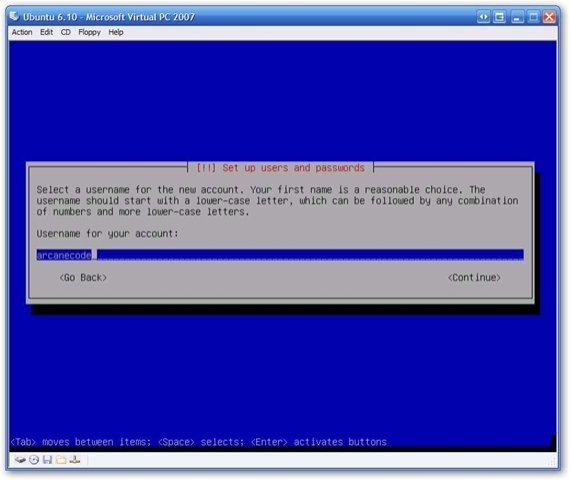 I’d think though if you are running a server you might have better luck running Virtual Server 2005. I know you said your company was stuck on VPC2007, but there’s exceptions to everything, and since it’s free you might get away with the “forgiveness is better than permission” plan. 😉 Meanwhile perhaps someone will read your post and have a good answer for you. it is possible to install it using the live-cd, you just boot it up as you would on a normal PC. when it gets to the garbled part do ctrl-alt-f1, perform all of the instructions for configuring X, using sudo. do ctrl-alt-f7 to go back into the main screen (still garbled), do ctrl-alt-backspace to stop X. do sudo startx, and install ubuntu from the administation menu in system. Once ubuntu is installed, follow the instructions already posted here to configure it again. it worked for me. It still didn’t work for me… I have no idea why…..I am still getting the message that its using a display to big for Virtual PC to handle…. Thanks a lot for this, works fine for me. I think I read somewhere in the instructions or elsewhere that the virtual machine/Ubuntu creates its own IP address? Or did I make that up? Does the Ubuntu install simply use the existing IP address of the host machine? This is at least semi-important to me as I’m wanting to install, but my computer is connected to my school’s network, and we have to pay for internet access per machine (hopefully, only per physical machine… but knowing the answer to this question in advance would be helpful). For some reason, the VPC wouldn’t read from the CD, so I used the Capture ISO image option and the installation began from there just fine… I just bailed out when it asked about partitioning a hard drive (which I have since read on these comments is only virtual, not physical). These instructions are awesome. I did the same with xubuntu. The funny thing is, when I hit Ctrl-Alt-F1, text mode was even harder to work with than the GUI. I stayed in the GUI, opened a Terminal window, minimized the font size, and completed the instructions. The answer is, it depends on how you have your network settings. Click on Edit, Settings, then go to Networking. For Adapter 1 you have a drop down. You will have choices for your host computers real network cards. Picking one of these WILL result in an independent IP address, and to the network it will look like you have a second PC. This is the default behavior. There’s another setting called “Shared NAT”. In theory, this is supposed to use the host machine as a gateway to the internet, and thus (again in theory) appear to the network as a single box, sort of like you turned on Internet Connection Sharing. But I have not tried this or validated it, so use at your own risk, I make no guarantees! If I forgot to install one of the resolutions that I would’ve liked to have used, will there be away todo it later? If so, can someone tell me how!? Thanks! Copyright notice: I got this instruction from the following website and it works great: http://www.geekzone.co.nz/freitasm/2184 , comment by: Jonathan. 8. Ctrl-Alt-Bksp and wait for desktop to appear. Many are reporting the 7.04 and virtual pc mouse issue. It appears to be a kernal problem affecting other recent linuxes as well. However, the mouse nor keyboard works after the install?!! I’m using a standard corded mouse and keyboard. after tryign to install ubuntu7, i also had the mouse and keyboard problem. Enter ‘Help’ for a list of biult in commands. I do not want to waste time trying to figure out the issue, so I tried booting into Kernel 2.6.17-10 and I was successful and the mouse works. I am a n00b in the world of Linux, so if anyone has a step-by-step inscturctions on how to fix the mouse issue under the new Kernel, please post. How do I find out which device the Kernel is refering to? someone help!!!! Not working here either unfortunately. Working on it though. How does one get to the text install option on Ubuntu v 7.04??!! If anyone has found a way please reply. I am new to Ubuntu and would like to install it on my hard drive. I just realized that the default install for Ubuntu is “LIVE CD” which is not mentioned anywhere on the official Ubuntu introduction page!. For everyone else who are having problems with the mouse, just boot into an older Kernel to get the mouse working. In my cause I had to boot into 2.6.17-10 (as I wrote back on April 20th. Post #73). When you restart the machine and you see the word “GRUB”, hit the “esc” key on your keyboard and select a different Kernel. For the Linux Guru, write back if you know how to get the mouse working under the new Kernel. For those who have been experimenting with version 7.04, I’ve created a new posting. I’m afraid I don’t have a lot of info to add right now, but let’s please shift any 7.04 comments there and we’ll leave this area for 6.10. One more update then I’ll stop with the 7.04 stuff, I found a work around (of sorts) that lets you use the numeric keypad as a mouse. See my post at http://shrinkster.com/ocx for more info. Got 7.04 working… Brand new Lenovo X60 with Vista Business. Main purpose of using Ubuntu is to hopefully cut the cord with Microsoft at some time in the future! No mouse support – but based on the excellent guide and mouse explaination – can use the mouse by using the Scroll Lock after making changes to the Keyboard Accesibility after install. Where do you find the network settings? Will keep exploring… wish me luck! I was able to get this working after 4 or 5 abortive attempts. In fact, I’m posting this from Firefox on Ubuntu 6.10 in a VM running on Vista. The install hung at various places when loading the base system and software. Once at 18%, once at 48%, etc. It looked like it was loading ok from the cd for a while then started looking for the network for some reason. After I set the cd setting in the VM preferences to use the primary controller everything seemed to work better. I also had to hit Escape vs Ctl Alt F1 to get to the console. At the first reboot into the gui the keyboard and mouse were acting very balky but after another reboot they’re working fine. Pointed the network at my Dell Wireless card and everything is working flawlesslly. Can’t wait to dig in. Thanks for this excellent how-to! Jerry, look to the left in the “Top Posts” area, there’s a post about issues with the mouse and VPC with Ubuntu 7.x. I don’t think you’ll solve the problem with VPC, OSX just wasn’t designed to run on the hardware emulated by VPC. Remember, VPC could care less what hardware you’re actually using, all the guest OS (the one running in the VPC) knows about is what hardware VPC emulates. Your best bet is to run bootcamp and dual boot between XP and OSX. If you don’t like the dual boot option, then instead I would suggest installing OSX as the primary OS on the MacPro. 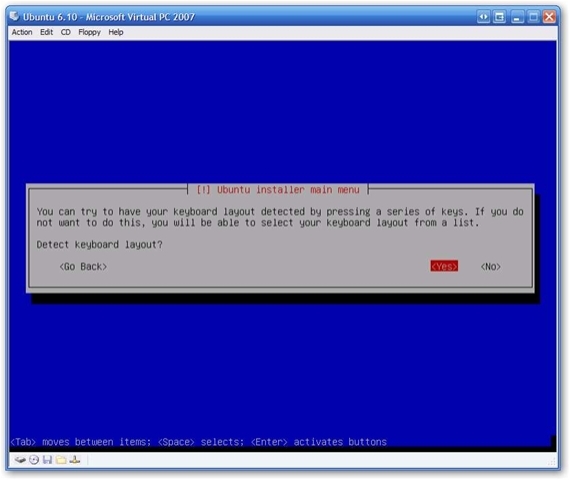 Then use Paralells (another virtual box, similar to VPC) to host XP. From what I understand Paralells does a great job with XP, many people run XP or even Vista in this fashion and say it works great. Leo Laporte, formerly of tech.tv and now at http://twit.tv loves this setup and uses it all the time. Thank you very much for this guide. The trick for getting the video color depth worked great for Debian 4 + Virtual PC as well. Once you load to the “desktop” after inputing your username and password your mouse stops working, seems like keyboard too. Following instructions are VERY similar to editing file for color depth. It will ask you for username/pass again. This will load again a file after you enter your password. Press CTRL+O to save, CTRL+X to exit, reboot, enjoy. I’m installing Ubuntu-Server 7.04 in Virtual PC 2007. However, I got a little nervous when I got the the disk partition section. It seems to have detected 17.2Gb of space. I only have about 7GB of free physical space. Is there any danger of the Ubuntu installer trashing my hard drive from within Virtual PC? Don’t worry Sean, you’re quite safe! One of the major features of VPC’s is the ‘sand boxing’, keeping things in the VPC separate from your real box. Quinn, it does take a bit, but not quite that long! Try upping the ram, that might get you over the hump. Also make sure you have the networking mode set correctly in VPC (Edit, Settings, Network). It may be trying to get to the network and can’t find it because VPC is pointed at a disconnected card. Thanks for putting my mind at ease. I’ll give it a go and let you know. This tutorial was a real help! Thanks very much for your detailed instructions with screen shots! I was stuck at the part with the garbled screens until I found your page. Excellent job! Thanks for the great set of instructions on installing Ubuntu. I have installed on an IBM T43P within Windows XP with screen resolution of 1600×1200. The maximum resolution I can get in Virtual PC is 1024×768. The install does not detect my ati card (substitutes an S3) and uses a generic “custom” monitor. Is there a way to maximize screen resolution and size of window? My only problem now is the crackling sound with sound blaster 16 emulation. I wish there was a fix for the audio. Thank you for your thorough instructions. I have one question, though. Did you run into any problems connecting Ubuntu to the internet? Ubuntu recognizes the network device drivers and even knows the name of my ISP, but will not connect to the internet. Do you know what could cause this and how to resolve the problem? Oh and to setup internet you just have to turn on vpc 2007 and go into os you want to and where you have hd icon cd drive icon etc there is one that rep a network button. right click it and you can choose which network card to use! Wonderful! It was my little trouble with Virtual PC, ScreenDeepth. Crtl+Alt+F7-F8 are my keys, but i can see the screen, modify DefaultDeepth, save file and reboot. EveryThing is O.K. I can grow up to Ubuntu 7.4 easily. You’ve rescued my live. Great! Thanks a lot…. Great article! I am attempting Xubuntu 6.06.1 and have followed the steps outlined, but I run into a problem before typing in “command:sudo cp /etc/X11/xorg.conf /etc/X11/xorg.conf.backupNote” and hitting the Ctrl-Alt-F1 key my screen resolution in VPC goes from 800×600 back to 640x200x4 and I can’t see the bottom of the bloody screen to make sure I am typing properly. I also tried and once I get to the “DefaultDepth” steps the screen is blank compared to the one presented in your steps. 1. Press CRTL-ALT-F1. This brings up the command line. 3. Add a “#” at the line that says LOAD DRI. This keeps it from loading(ex., LOAD DRI becomes #LOAD DRI). 4. Go to the the area (towards the bottom of the file) where the default Depth is and change it from 24 to 16. 5. Save (press ‘Ctrl’+’O’) and exit out of nano. 7. This will kill and restart the GUI. 8. You will get a screen resolution of 800 x 600 with 16 color depth. I then hit the install icon and away we went! It took about 10 minutes to go through the whole process but it worked. This was originally posted at the Ubuntu Forum website, in the “Apple PPC Users” forum in the thread titled ” problem at boot when installing xubuntu” and posted by the user jazzman. I installed 6.1 and followed all the steps but didn’t get the garbled screen when the installation was done. Instead I get a black screen with a large Ubuntu Logo and a progress bar beneath and nothing seems to be happening. I’ve waited for 5min, I might let it sit for another 15min. Any ideas? ALERT! /dev/hda1 does not exist: Dropping to a shell! This is an excellent guide to resolve problems with the garbled scrren problem almost everyone will run into after the initial installation. Good job and thanks! OK, I’ve made more progress. I reinstalled and now get to the garbled screen where I’m supposed to hit CTRL+ALT+F1 key combo to enter the text stuff. It doesn’t work, I press the key combo and it takes me to another garbled screen. If I reset and restart and hit esc at the grub loader thing I can enter the text screen but if I enter the sudo code to modify that page it just shows up as a new file and i cant find the DefaultDepth text because there is no text for that page found. Any advice? oh i can’t believe what i’m seeing with my eye. Merrill Amram. I installed ubuntu 7 on Virtual PC and it worked. I am not a coputer geek, just an enthusiast that tries things some times, but too far gone in my line of work to get into computers now. I was not pleased with the garbled page when I tried installing it on my Vista Virtual PC, so I deleted and started again. This time, I selected install with safe color mode or so. It worked. I am now at cross roads to make the new virtual OS connect to the internet. thru my vista OS. Can it be done? Thanks a lot! Is is okay to use Microsoft’s Virtual CD Control Tool? I didn’t tried to install Ubuntu yet because I don’t have a recordable CD and not sure if the Virtual CD Tool will works fine as an alternative. Please respond. I was facing the same problem. Thanks for all the help. Ah, great, thanks for the current link to 6.10 Nalty. I have the same problem with the sound. Has anyone figured this out already. Please post reply for the workaround. T.Y…advance. Thanks. Just got Debian Etch running under Virtual PC 2007 with your invaluable assistance. Looks great now. I think I remember having this same garbled screen problem with Darwin (Apple’s branch of FreeBSD) too, but don’t know if the file structure is the same or not. I may have to try that again now. Virtual PC only gives us 8 mb or video ram to play with. That doesn’t seem like that would be sufficient. Anybody know how to increase video ram in VPC? 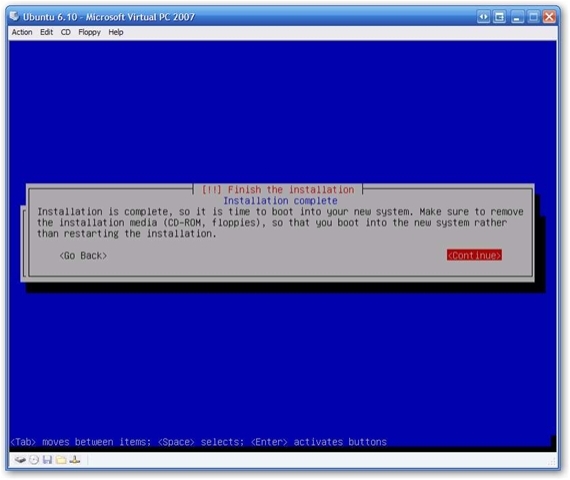 You can mount an ISO image in VPC when you start the virtual machine. I’ve used the VCD tool before, but you don’t need to. at boot-time use the F6 options to give kernel params. Mouse will work on start up. Hi. Quick question: is it normal that my install has been at 83% of Installing Base System (it says it’s ‘Installing the kernel, retrieving and installing linux-generic’) for about 15 minutes? Or does it take that long anyway? And it won’t delete Windows, will it? I mean once it’s installed, it’ll still fully run through Virtual Machine? I’d appreciate some replies. Thanks. 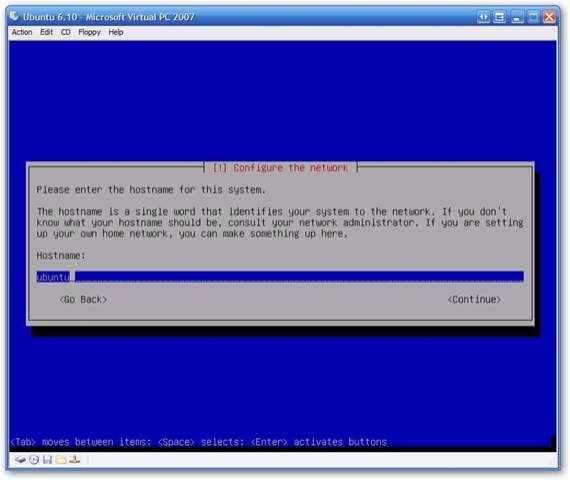 The host system has Windows XP Home Edition. Isabell – No, it won’t delete windows. You’re quite safe. As to the time, hard for me to tell as it’s different for everyone, I seem to recall it took me about 30 minutes over all to install. You may want to bump up your ram if you can, 200 is sort of low for the X/K/Ubuntu variations. Also, I’ve done an updated post on installing version 7.10, you may want to go read it instead of the 6.10 post. One other quick thing that I hope will be easy to fix: VPC won’t pick up my mouse. It says in the options that I need to install something for Virtual PC to make it do that, but I can’t get to the file it says to click on without the mouse, so I don’t know. Bob – Not sure, never heard of this behavior before. Are you sure you used the nosplash option and and picked safe graphics mode? for a tip on how to make the keyboard arrow keys into a mouse, that may let you get to the options to do what you need to do. Although the behavior sounds odd, since VPC emulates a pretty standard mouse. Okay, thanks, I will do. 🙂 Bye! Gracias por el tutorial, estaba envainado. muy bueno felicitaciones. Estoy instalando Kubuntu 6.0.6.1 en un virtual pc 2007 todo funciona bien hasta que llega a la instalacion y en la copia de archivos llega hasta un 48% quedandose estancado en ese punto y no avanza mas, quisiera saber que puede ser? Oswal asked: Hello arcanecode: I am installing Kubuntu 6.0.6.1 in a virtual pc 2007 all functions well until arrives at the instalacion and in the copy of files arrives to a 48% being remained stagnant on that point and does not advance but, wanted to know that can be? Thanks. Oswal: Hi Oswal, not really sure. Could be low memory, or disk space issues. You might try re-downloading your iso just in case the image got corrupted during download, I’ve seen that happen before. Other than that, it’s really hard for me to tell. Hola Oswal, no realmente seguro. Podría ser la memoria baja, o los asuntos del espacio de disco. Usted quizás trate el re-descargando de su Iso apenas en caso de que la imagen fuera corrompida durante la descarga, yo he visto eso sucede antes. De otra manera que eso, es realmente duro para mí decir. I had the same problem as Oswal installing Ubuntu, installation froze in copying files 48%. The problem occured when i tried to install Ubuntu from physical CD in Virtual PC, when i started Ubuntu as ISO image everything worked fine! 20 minutes on a Vista Ultimate host machine. After I created the VM I went into the video settings and selected the option to use Guest OS resolution settings. Then I used an ISO image of Ubuntu 6.10 x86. At the Installation screen I pressed F4 and selected the Safe Mode Graphics option. Then I did a typical install of Ubuntu. My host machine has an Intel Q6600 with 8GB RAM and Vista Ultimate. It took 20 minutes to complete the install. 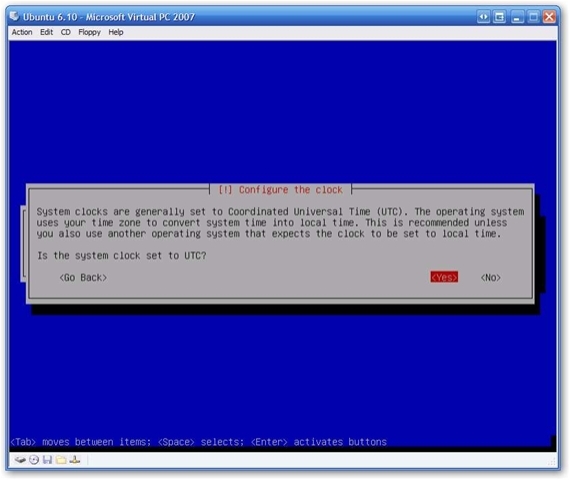 I should note I am using Virtual PC 2007 SP1. All works well but audio. I had problems getting audio to work with dual boot too. I have Realtek HD Audio. Does somebody had some stability issues when using ubuntu on MSVS 2005 R2? Our Ubuntu 9.10 server freezes every week at least 1 time. I tried adding more RAM (1 GB), the issue is the same, i tried adding more swap space (around 1,3GB) and still the problem remains. Any suggestins? really nice tutorial! this is really helpful for me! Люди, подскажите надежного проверенного мага, который наверняка поможет вернуть любимого человека!Пыталась обращаться за помощью и через интернет и через газету, но то кидалово, то развод!Жаль, так нужна помощь!Откликнитесь!Или напишите в личку! In this Cosby Sweater Venture, every episode offers various sorts of sport to recreate his magic loud shirts. for your current and future.